Linux version compiled and attached below. 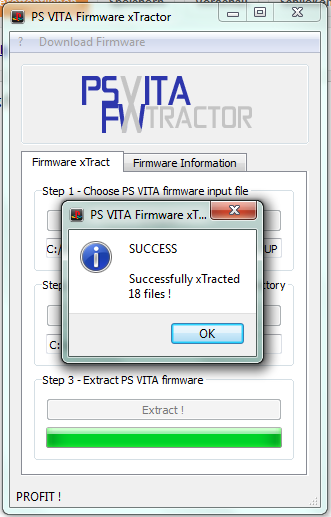 I just updated the PS VITA FW xTractor, changelog is attached below. Do not lose your self control, this is the most important thing. to disclose your private password to decrypt it! The problem is, you might not get it back if it's encrypted. You decide if it's worth it. As well the court can account a sum X per item to be checked. This might become expensive, so expect that you can not get all back without investing a huge sum. Publishing, sharing or redistributing copyrighted data is illegal. Don't do it! Once you did, it's hard to proof anything else. 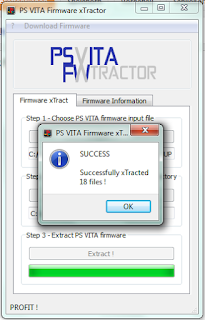 If possible, remove all files or data which you published. This may be an advantage and good for you in front of court. The company might invite you to a private personal discussion. Under any circumstances - do not go there if you don't feel 100% prepared. You will be confronted with 1-3 of highly skilled lawyers if you decide to join their meeting. Usually their lawyers have a very good experience in human psychology and will get you to sign contracts which they can use against you sooner or later. An example would be that this contract includes that you are responsible for ALL further damage which MIGHT be caused through your data you may have published. This damage has a trivial worth and can raise up to multiple hundred thousand euros. If the company has anything reliable proof against you, they arrange a court meeting, not a personal one. Remember you can not be forced to agree a private meeting. It can cause a lot more trouble than you expect. Any phone or personal communication can be used against you. Text-communication is easier to overview and you can let it be checked by your lawyer or person of trust. Be sure your lawyer (if you choose to take one) has great experience in IT law. Every lawyer will say "YEAH SURE" if you need one, but just because they are interested in your money and not your behavior. Use Google or ask at your local government for a decent attorney of law. If they company insist on a contract, let your lawyer setup it. Do not be too optimistic and think you could win against a Billion-$-Company-X. There is a difference between "be in right" and "get right". In 99,9% of the cases, the party with more money will win even if you acted 100% legal. They can spend limitless resources to make your life worse. A court case can take several years and in those years you have to pay your lawyer and more. Do you have the money to do this? No? Then accept that you are fu*ked and contact the company. If it is not too late, make a clear statement that you will not continue your work which belongs to the case. Say sorry and distance yourself from anything relating. As mentioned in point 7, a long and time consuming court case costs money. Probably more than you have. Follow point 7 as fast as you can, so you are aware if the company is OK with your apologize. If you are lucky, you are out of the deepest sh*t.
If it comes to a confrontation in front of court, you are warned weeks in advance. Make notes, let your lawyer research all possible ways to defend you. Most courts are not aware of up to date IT law, as the most laws were formed in analog times, so the Billion-$-Company-X will try as hard as they can to proof that what you did was wrong, even if it is actually legal. Don't let them provoke you. Shut up and let your lawyer do the work, except the court asks you. If possible, "no comment". No comment == you can't make anything worse. As said before, if you do not have unlimited money or some atomic bombs behind you do not fight against dragons. You can not win. The world is ruled by money and the ones with the most will always get their will. Do not think you can change this, even if it sounds a bit sad it has to be said. Since I experienced many of such cases myself, I know best how you feel if it happens. If you need assistance, do not hesitate to e-mail me. If you find any huge mistakes or think I have forgotten something important, let me know.